Team Outdoors is not just about fishing tackle. Visit our fishing guide website, Green Bay Outfitters, to learn more about our Walleye and Musky fishing trips and charter services in Green Bay. We can accommodate groups from 4 to 16 people for a full day of guided fishing on the Bay of Green Bay. With the largest team of fishing guides on Green Bay we can make an experience found no where else! Our all-inclusive trips can accommodate groups up to 8 for a memorable fishing getaway. 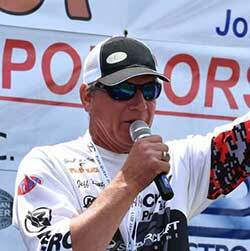 Captain Jeff Boutin is a US Coast Guard Licensed 50 Ton Masters Charter Captain and Tournament Angler from Mequon WI. Jeff has been fishing for walleyes for over 30 years and can teach you some of the techniques used in tournament angling in order for you to be more successful at fishing in the future. Depending on the time of year, fish can be caught using a variety of methods. Jeff can teach you some of the finer details behind jigging, bottom bouncers, casting, and trolling with crawler harnesses and crankbaits. You will only find Jeff on the Bay of Green Bay because it is one of the top walleye destinations in the Midwest. Limits of eater sized walleyes are the normal from spring through summer. Trophy fish can be found throughout the bay, with the waters of Door County providing some of the best Trophy walleye fishing in the North America! Green Bay Outfitters is your destination when it comes to Walleye and Musky Fishing. We can accommodate groups from 4 to 16 people for a full day of guided fishing on the Bay of Green Bay. With the largest team of fishing guides on Green Bay we can make an experience found no where else! Our all-inclusive trips can accommodate groups up to 8 for a memorable fishing getaway.